The search for missing Baylor basketball player Patrick Dennehy centered Tuesday on a gravel pit and the banks of the Brazos River, just miles from an apartment he shared with the former teammate accused of killing him. The search began after the roommate, Carlton Dotson, talked with authorities in Maryland. He was ordered held without bail Tuesday in Chestertown, Md., on a murder charge, and his lawyers opposed his extradition to Texas. Dotson, 21, admitted to FBI agents that he shot Dennehy in the head "because Patrick had tried to shoot him," according to an arrest warrant released Tuesday. Defense attorney Sherwood R. Wescott would not comment Tuesday on whether Dotson confessed. 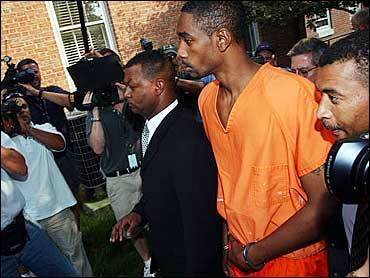 Dotson told a reporter outside the Chestertown courthouse Monday: "I didn't confess to anything." Dennehy has been missing since mid-June. A police informant told police that Dotson told a cousin he shot Dennehy in the head after the two argued. Law enforcement officials, some on horseback, searched the banks of the Brazos and the gravel pit, surrounded by pastures, tall grass and sunflowers, just miles from the Baptist-affiliated university where the two played basketball last season. Dotson's estranged wife said Tuesday that he needs psychological help, but that she does not believe he killed Dennehy. An extradition hearing was set for within 30 days after the defense refused to waive the right to such a hearing and allow Dotson's immediate transfer from Maryland to Texas. Outside the Maryland courtroom, defense attorney Sherwood R. Wescott would not comment Tuesday on whether Dotson had confessed to killing Dennehy. "Carlton, if you know where our son is, please let us know," Dennehy's mother, Valorie Brabazon, said Tuesday on ABC's "Good Morning America." She said she still feels "that my son is out there somewhere alive." According to an earlier search warrant affidavit, an unidentified informant reported to Delaware authorities that Dotson told a cousin he shot Dennehy as the two argued while shooting 9 mm guns in the Waco area. CBS' Melissa McDermott reports Dotson called officers Sunday from a grocery store in Chestertown, about 55 miles from his hometown of Hurlock, and said he needed help. Chestertown Police Chief Walter Coryell told the CBS News Early Show that the help Dotson required "would best be described as psychological help — counseling." He claimed to be hearing voices. "He did not elaborate on what those voices were saying to him," the chief said. Dotson was "open, friendly and relaxed" with the police, Coryell said. "Since I've been in contact with him, I've had no reason to doubt his state of mind or his mental condition." Friends say Dennehy told them that he and Dotson obtained guns because they were being threatened. The officers took him to a hospital, where he was evaluated but not admitted. While still at the hospital Monday, Dotson asked to speak with FBI agents, authorities said. "They interviewed him and during the course of that interview evidence was developed which led to the obtaining of the arrest warrant by officials in Waco," Coryell said. After the warrant was issued, two officers escorted Dotson, in handcuffs, into the police station about 9:20 p.m. He emerged about 15 minutes later with Coryell, another officer and an FBI agent. Dotson was fingerprinted and processed at the police department, Coryell said. Contradicting some reports, Dotson told reporters as he left the courthouse that he hadn't confessed to anything, CBS News Correspondent Lee Cowan reports. Shortly after his arrest, Dotson had referred all questions to his lawyer. Dotson's attorney, Grady Irvin Jr., said in a telephone interview that he had last spoken with his client over the weekend. He would not say what they discussed. "It is most unfortunate that police have come to the conclusion that there is a death," Irvin said. "I am uncertain as to how they came to that conclusion, that Patrick Dennehy is now dead." Calls to the FBI were not returned. Dotson's estranged wife, Melissa Kethley of Sulphur Springs, Texas, said she cannot believe Dotson killed Dennehy. She wouldn't elaborate or discuss their marriage. She said that although Dotson called and told her Monday that he was talking with the FBI, he didn't tell her he had been to the hospital. "But I've known that he's needed psychological help for a very long time," Kethley said, crying, during a telephone interview. "He needs help, the boy needs help. ... Maybe, if he did do this, it's a blessing in disguise, and he can get the help he needs."